Join us, The West Ladies in our original DVD series. 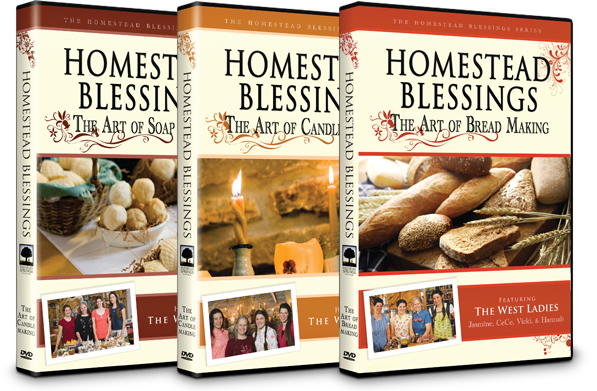 The Art of Soap Making, The Art of Candle Making, and The Art of Breadmaking are fun-filled programs that include homemaking skills presented in an educational and entertaining three DVD set. With southern charm and gracious hospitality we welcome you into this beautifully-photographed broadcast-quality series that has been encouraging folks of all ages and teaching valuable skills for 10 years! Just want one DVD?.......Click on the blue arrows for drop down menu. Join us, The West Ladies - Jasmine, Cecilia, Vicki, and Hannah - in three exciting instructional and inspirational DVDs. The Art of Canning, The Art of Gardening, and the Art of Herbs are fun-filled programs that include homemaking skills presented in an educational and entertaining three DVD set. With southern charm and gracious hospitality we welcome you into this beautifully photographed High Definition broadcast quality series that audiences around the world have come to love so much. These three fun and useful DVDs will help to complement numerous homemaking endeavors. 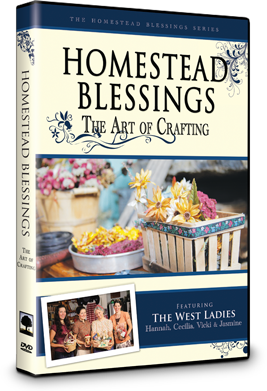 This inspiring DVD teaches a host of entertaining and practical crafting skill-sets. This episode teaches a large assortment of enterprising skills that will assist in making enjoyable crafting creations. The program provides instruction and tips good for beginners as well as seasoned craft designers. From hand printed napkins, to gingerbread ornaments, to dipped pine cones, bird feeders, dried potpourri, and a host of other crafts, viewers will learn a wide-range of techniques. The Art of Crafting is a valuable tool for all ages and is sure to be a welcomed addition in your home. 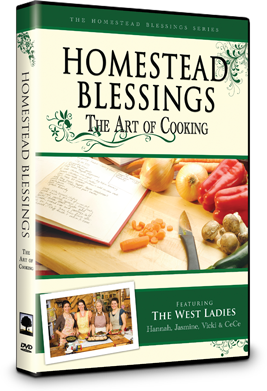 The Homestead Blessings Complete Nine Pack is a fun-filled collection of homemaking skills presented in an educational and entertaining nine DVD series. With southern hospitality we welcome you into this unique series that is encouraging ladies of all ages and teaches valuable skills that can be applied to many homemaking endeavors. The nine DVD set includes instruction in bread making, candle making, soap making, canning, gardening, herbs, cooking, dairy, and sewing. This deeply discounted set is the perfect tool to teach a wide-range of valuable and fun skills that will last a life-time. Watch the Trailer to the left. Join us, The West Ladies in The Art of Quilting. 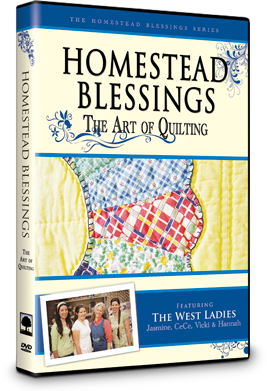 This fun and helpful DVD teaches a host of rewarding quilting skills and techniques. Develop your understanding of quilting with our easy teaching approach and apply helpful skills to your home as you make fun and beautiful quilting creations. 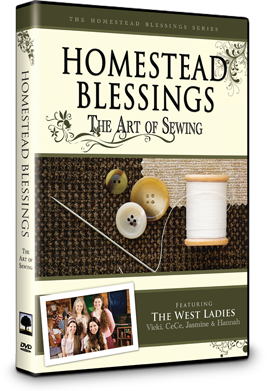 This inspiring and educational DVD teaches a wide-range of fun and useful sewing skills. Expand your knowledge of sewing with our helpful and down-to-earth instruction, and develop a wide assortment of useful skills that will assist in making wonderful sewing creations. This program is full of useful sewing instruction and tips that will inspire and teach seamstresses of all levels. From pillow cases, to baby blankets, to blouses, skirts and rag quilts, viewers will learn a host of techniques. If you are just starting out, or expanding your skills with new tips and ideas, The Art of Sewing is the perfect tool. Put on your apron, warm up the oven and savor The Art of Cooking. With years of experience preparing delectable southern recipes, we, The West Ladies - Vicki, Jasmine, Cecilia, and Hannah - teach a wealth of fun and helpful kitchen essentials that will make your culinary adventures richly memorable. The Art of Cooking features fun-filled instruction in cooking breakfast (pancakes, fried potatoes, fried apples & onions), lunch (pizza, tomato soup, salads & homemade dressing), and dinner (pot roast & veggies, buttermilk biscuits & gravy, green beans, peach cobbler). In The Art of Cooking, we'll provide you with plenty of useful tips and tricks in the kitchen, this DVD will inspire and motivate you to expand and refine your culinary skills. In The Art of Dairy Delights we, The West Ladies — Vicki, Jasmine, Cecilia, and Hannah — provide a wide-range of helpful instruction in making wonderful dairy dishes. Explore fun and practical creations that are sure to greatly enrich many cooking endeavors, and in the process learn a wealth of important skills that will lead to nutritional, economical, and delicious benefits that come from making your own dairy products. The film includes instruction in the processes of making scrumptious ice creams, smooth and tasty butters, rich and creamy yogurts, and delectable cheeses. From simple tasks such as basic equipment needs, to the perfect ingredient combinations, The Art of Dairy Delights is an outstanding resource for cultivating dairy in the kitchen. 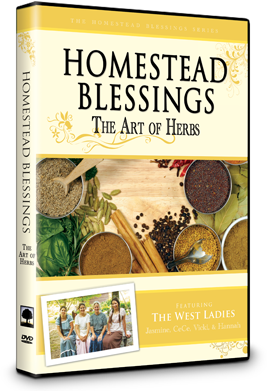 This six DVD set includes: The Art of Bread Making, Candle Making, Soap Making, Canning, Gardening, and Herbs. Help support future Homestead Blessings Projects, shop with us! A Journey Home tells the story of the extraordinary path traveled by Tommy Waller, his wife Sherri, and their 11 children. 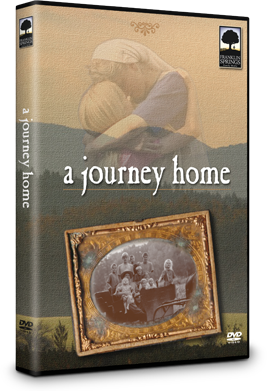 The Journey Home DVD is packed with Bonus Features that will enhance your experience with this inspiring family and features music by The Peasall Sisters, Marty Goetz, and Stacy Jagger. 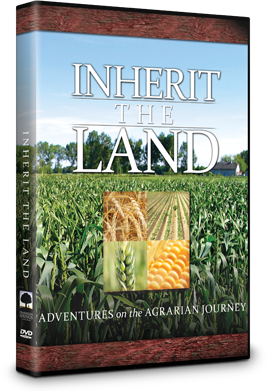 Inherit the Land features families from across the nation, including the Michael and Susan Bradrick family in gorgeous Washington state, the Houk family in central Illinois — who’ve been farming for three generations — the Wilson family in Virginia, our family and many more! Hosted by Jim Bob Howard, this DVD is beautifully filmed to capture the true essence of family life on a farm. 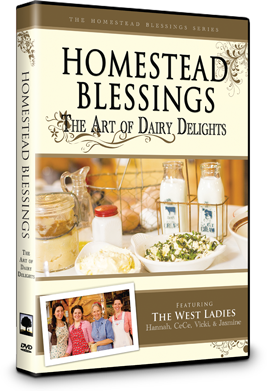 This DVD will cast a vision for your family by providing an introductory look at the blessings found when families work in an agrarian lifestyle. From a simple garden in a suburban backyard, to a full-fledged multi-thousand acre farm, or something in between, these stories will not only bless those that are contemplating an agrarian path, but all families that have a heart turned toward home and enjoy seeing a beautiful picture of family life.